Hi friends, oh do I have a treat for you today. Together with some amazing bloggers we've teamed up to bring you the mother of all giveaways. April Showers usually brings May flowers, but this April Shower can bring you a $500 VISA Gift Card! I know, I know, after all it is April Fools Day but let me promise you this giveaway is the real deal. Use the Rafflecopter below to complete all of the mandatory entries for your chance to win. For more chances, unlock the bonus entries and complete as many as possible. Good luck stylish readers! Make sure you stop by and visit all of these lovely ladies to let them know how you would spend $500. 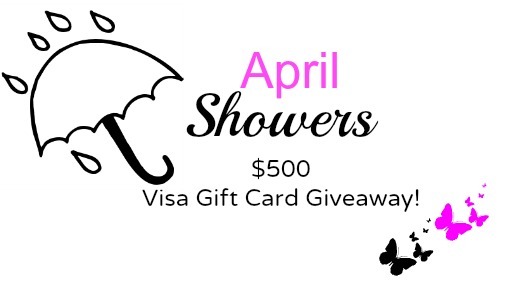 The April Showers Giveaway is for one USD $500 Visa Gift Card. This giveaway is open internationally to people 18 years and older. The giveaway will run from Monday April 1st, 2013 12:01 AM to Monday 15th April 2013 11:59 PM. ALL mandatory entries must be completed in order to win, including the winning entry. Once you have completed the mandatory entries, the optional bonus entries will be unlocked. Optional bonus entries are not required to win, but will increase your chances of winning. ALL entries WILL be verified, so please be honest in completing the entries. The winner will be announced on this Rafflecopter after the winner's entries are verified and the winner is contacted via email. To claim your prize, please respond to the email within 24 hours, failure to do so will result in a re-draw. Once the winner has been selected, the decision is final. This giveaway is not affiliated with Visa, Facebook, Bloglovin, Google, Twitter, Instagram, Pinterest, or any other social media platform. Hey neighbor! I read your About Me section and I know all about what it's like to be in a small town and have a hard time finding outlets to express your passion! I'm in Tennessee too! Knoxville. Thanks so much for deciding to take part in this giveaway! I am pretty new to the blog world so I rely on things like this to introduce me to new blogs and the faces behind them that inspire, motivate, and encourage me everyday! I'm so happy to have you as a part of my daily routine now! I appreciate the work that I KNOW you put into your posts and I am so grateful that you have opened up your life to us! If I'm lucky enough to win this giveaway, I would spend the money on new makeup brushes and some new outfits to wear to the beach next month. (My first vaca in 6 years!) Thanks a million!!! Wow this is an awesome giveaway. I never win any and i hope to win... have a great Monday !